"Grandpa Nazarbayev has quit!" wept a little girl in a video that has gone viral among Kazakh internet users since Nazarbayev made his surprise announcement on Tuesday on state television. An adult could be heard explaining to the sobbing girl: "He has retired, he has got old after all". 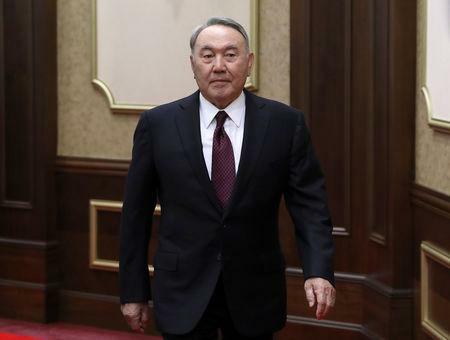 Nazarbayev's announcement he planned to hand the presidency to a lieutenant came out of the blue, even though there has been speculation about when he would step down for years. "I feel uneasy," said a 38-year-old Kazakh housewife who asked not to be named, when asked what she made of Nazarbayev's announcement. "He has done so much for our people, it's a shock of course," said 16-year-old student Nariman. "It will be unusual to have another person at the helm." Some people's knee-jerk reaction was to buy dollars - queues formed at night at some bureaux de change and the cash exchange rates briefly jumped, prompting the central bank to warn cash traders against "speculation" in the morning. "I think this was a timely decision. You know, one needs to make an exit in a proper manner and at the right time," said Gennady, a 67-year-old trade union official. Some Kazakhs joked that the veteran leaders of Kazakhstan's fellow ex-Soviet states, Russia and Belarus, could take a leaf out Nazarbayev's book and bow out. "I challenge my friends Vladimir Putin and Alexander Lukashenko to do the same," read a humorous caption to Nazarbayev's final photo behind the presidential desk in an image shared by many Kazakhs on social networks.